Jasol, a far flung village in the border district of Rajasthan, is witnessing something unusual and unprecedented. All these days the Asha Sahyojinis used to visit their houses loaded with all types of colorful but heavy files, all to have a check on the population’s health, especially women and children. Asha Sahyojinis, all women, are the volunteers who work under the supervision of the District Health Department and UNICEF. These women will work door to door and maintain a record of health, focusing primarily on pregnant women and health issues related to them and their newborns. But manual dealing with the data, punctiliously feeding and fetching it from the thick and heavy registers, is much tedious a task than it sounds. Plus, since the health workers are not the actual doters, sometimes people din’t take their diagnosis and their advice very seriously. Some also complained that co-operating with an Asha Sahyojini would take a lot of their precious time and so they prefer not to. These all were raising loud alarms to the health department and the UNICEF, but to much relief, these departments woke up to this noise and decided to go hi-tech. In a joint effort by the district health department and UNICEF, Tablet PCs have been brought in use and Jasol has been chosen to run the pilot project. Which means if this project performs well and scores high on the post project evaluations, projects tantamount to this will be drummed all over the state. 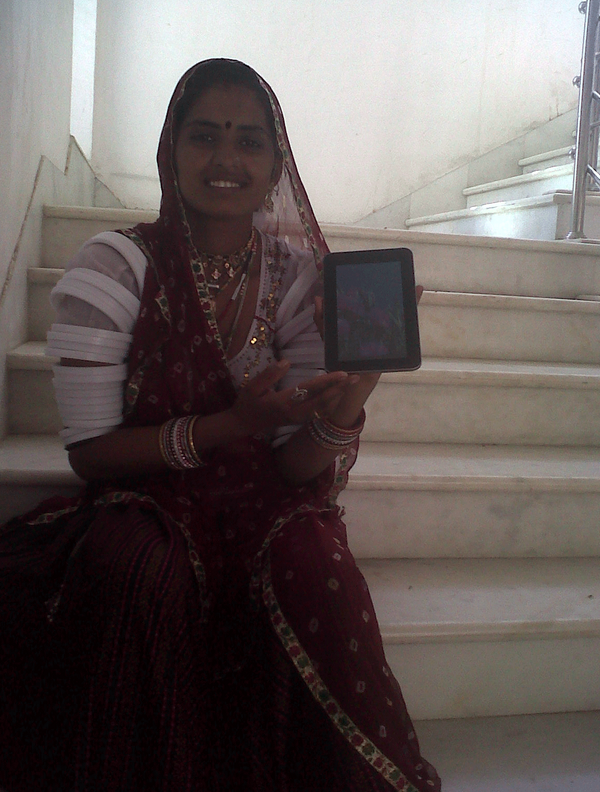 The software or the “App” for these Tablet PCs have been designed by the Indian Institute of Technology, Jodhpur. A lot of ASHAs have been trained now to use the Tablet PC in conjunction with the related Application. As a result, not only all their heavy bags have been replaced by small pouches, they have started to sound more smart and convincing to the general public. It is also the charm of technology which now makes people want the Asha Sahyojinis to visit there houses for health check-ups. When we spoke to one of these health workers who have been recently trained to effectively use the Tablet PC says, “I am now a lot more confident with my job. More and more people listen to me and even approach me seeking health advice. As I have pictures and visuals, just waiting a touch to start working for me, people get to understand a lot more than I could have managed on my own without this Tabs and this App. ” As the old adage goes, “Pictures are worth a thousand words” seems to fit here quite perfectly. Another worker who just had her first day in the field with the Tab said that she was so happy that she didn’t have to carry the registers on her back today. Her work got such a pace which she never imagined. Making and recording the health queries were never this easy. When it came to explain to the pregnant ladies, the harms of not taking the needed care while their pregnancy, the related videos worked like a charm for her. Even those people who can not read or write, could understood a great deal, all by looking at the pictures and diligently made educative videos. The officials are extremely delighted the way this newborn project has fared so far. The most assuring feature toed to this project is the easy and timely reminder sent through the SMS. These reminders are not only sent to the ASHA concerned but also to the intended house, where the check-up or follow-up has to be done. This indeed is a very healthy project, a good initiative for a healthier India. Jasol has been purposefully selected to run his project as it has been found in the surveys that in this very region of India, the infant and maternal mortality rate has been recorded the maximum so far. We wish all the success to this project and hoping to see this project hoping to all the other villages awaiting good medical facilities.